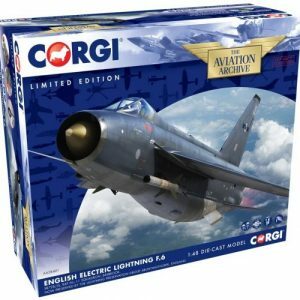 Corgi BAC Lightning F6, XR770/D, 56Sqn ‘Firebirds’, RAF Wattisham 1976. As the only British built Mach 2 capable fighter, the BAC Lightning spent the Cold War years being scrambled to challenge Soviet Tu-95 ‘Bear’ bombers, which regularly encroached into British airspace. 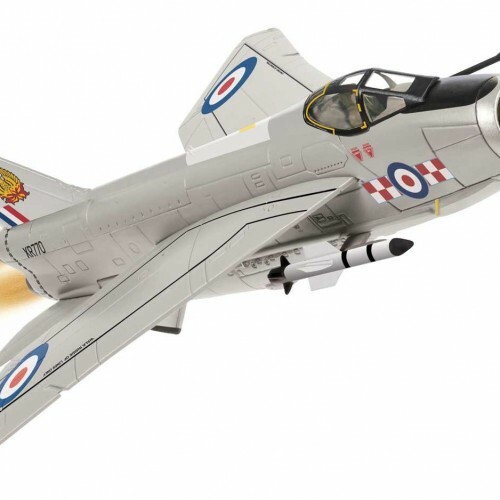 A highly capable interceptor aircraft, the Lightning possessed both blistering speed and spectacular acceleration and is regarded as perhaps the most enigmatic jet aircraft to ever serve with the Royal Air Force. 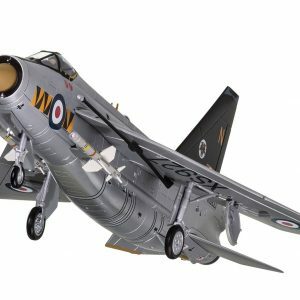 XR770 first flew in 1966 and famously appeared at that years Farnborough Airshow, wearing Royal Saudi Air Force colours, where it flew ten demonstration flights. In the years to follow, this famous aircraft went on to serve with No.74 ‘Tigers’,No.23, No.56 ‘Firebirds’ and No.5 Squadrons, before ending its service life with the last Lightning fighters at No.11 Squadron at RAF Binbrook. Lightning XR770 is now preserved at RAF Manston History Museum, wearing distinctive RAF No.5 Squadron red spine and tail colours and was the subject of a previous Aviation Archive release (AA32311). Including a specially signed card by ex 56 Sqn pilots Dennis Brooks and John Ward. Due to low stock, orders limited to one per customer.